HARLEM, NY – June 5, 2018 – Last evening, the Apollo Theater celebrated its 13th Annual Spring Gala, raising over $2 million for its year-round artistic and community programming initiatives. The concert portion of the evening was hosted by David Alan Grier, and opened with a rousing musical performance by teenage Showtime at the Apolloalumnus Aidan Doran. The concert also featured incredible 90's throwback performances by Salt-N-Pepa ("Shoop," "Push It"), Tony Toni Tone, Bell Biv DeVoe ("Poison"), and Brandy, who wowed the crowd with "What About Us" followed by a mashup of Whitney Houston classics including "How Will I Know" and "I Wanna Dance With Somebody (Who Loves Me)"; rising-star chanteuse Sarah Ikumu of Fox’s Showtime at the Apollo belted an exquisite cover of Common and John Legend's "Glory"; and 4THAve, who tore up the stage with a toe-tapping medley of Motown and contemporary hits. The concert culminated with a New Orleans-style second line out of the theater and 1-block down 126th street to the after party led by Harlem's own The Marching Cobras. Every year as part of the evening, the Apollo recognizes individuals and corporations for their outstanding contributions to the performing arts, community leadership, and philanthropic support of initiatives in the African American community. 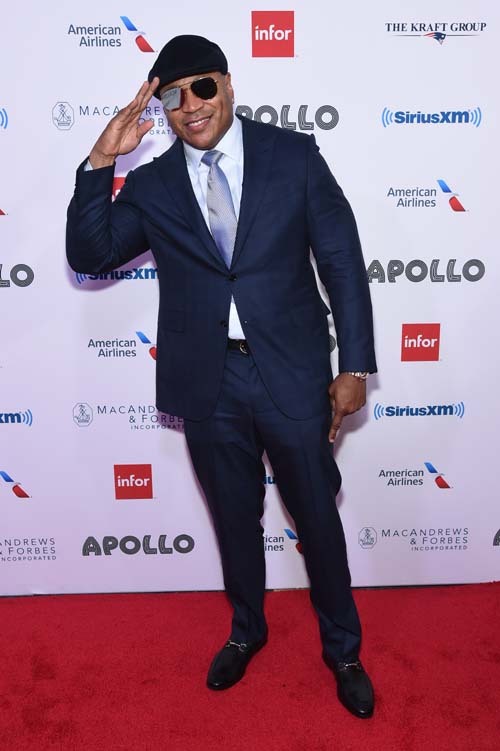 Last evening, SiriusXM's Shade 45 host Sway Calloway introduced LL Cool J who presented the award to SiriusXM's Scott Greenstein, President and Chief Content Officer, who accepted the Corporate Award in recognition of the company’s outstanding contributions in performing arts and community leadership. The night continued until after midnight with a much-buzzed-about after-party held in a lavishly decorated tent created by celebrity event planner David Stark. Guests danced to the sounds of the celebrated DJ D-Nice and sipped on cocktails provided by Moet/Hennessy. Gala Chairs: Robert K. Kraft and Karen and Charles Phillips. Honorary Chairs: Laura and Richard Parsons, and Ronald O. Perelman and Anna Chapman. Gala Vice Chairs: The Dolan Family Foundation, Katherine Farley and Jerry I. Speyer, Debra and Leon Black. The 2018 Apollo Spring Gala was made possible with generous support from American Airlines, Coca-Cola, BNY Mellon and CBS. With music at its core, the Apollo’s programming extends to dance, theater, spoken word, and more. This includes special programs such as the blockbuster concert Bruno Mars Live at the Apollo, the world premiere theatrical reading of Ta-Nehisi Coates’s National Book Award-winning Between the World and Me, 100: The Apollo Celebrates Ella, the annual Africa Now! Festival, and the recent New York premiere of the opera We Shall Not Be Moved. The Apollo is a performing arts presenting organization that also produces festivals and large-scale dance and music works organized around a set of core initiatives that celebrate and extend the Apollo’s legacy through a contemporary lens; global festivals including the Women of the World (WOW) Festival and Breakin’ Convention; international and U.S.-based artist presentations focused on a specific theme; and Special Projects, multidisciplinary collaborations with partner organizations. Since introducing the first Amateur Night contests in 1934, the Apollo Theater has served as a testing ground for new artists working across a variety of art forms and has ushered in the emergence of many new musical genres—including jazz, swing, bebop, R&B, gospel, blues, soul, and hip-hop. Among the countless legendary performers who launched their careers at the Apollo are Michael Jackson, Ella Fitzgerald, Stevie Wonder, Billie Holiday, James Brown, D’Angelo, Lauryn Hill, Dave Chappelle, Machine Gun Kelly, Miri Ben Ari, Sarah Vaughan, Gladys Knight, and Luther Vandross; and the Apollo’s forward-looking artistic vision continues to build on this legacy.